Charles Spurgeon’s ministry was marked with guilt. After the Surrey Gardens Music Hall disaster on October 19, 1856, he fell into so deep a depression that even the sight of the Bible brought much anxiety. His text was Proverbs 3:33, “The curse of the Lord is in the house of the wicked.” He never preached from that text again. Spurgeon had known guilt before. Early in his ministry, he lost sleep imagining the Ten Commandments saying, “You have broken me.” In January 1850, Spurgeon’s guilt erupted violently. 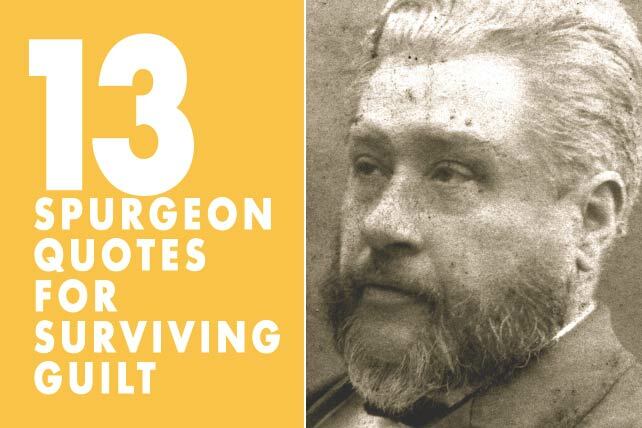 And so, from the depths of Spurgeon’s guilt we excavate these 13 quotes. In reading them, may you be as healed as Spurgeon was in saying them. In the midst of his misery, Spurgeon discovered a mercy wider than his wounds and deeper than his depravity. Spurgeon believed—and we must believe—that God is in the business of new beginnings. No sin is greater than Christ’s desire to forgive it. No conscience is too stained that God cannot wash it white. Whatever guilt you are feeling today, be encouraged that the same God who didn’t abandon Spurgeon will not abandon you. Take Jesus’ words to heart: “Come to me all you who are weary and burdened, and I will give you rest” (Matthew 11:28). Theology and Curator of the Spurgeon Library at Midwestern Baptist Theological Seminary. He is currently working on the multivolume publication The Lost Sermons of C.H. Spurgeon, slated for release next year.